The other day I found a Rose colored 90 etalon. The views though it were better than my first Original 90. Not sure the rose color is anything special but it looks different than a normal one. Edited by LarryAlvarez, 14 March 2015 - 10:45 AM. Note that both ITFs are made with an RG630 substrate. So now I set upon trying to find a suitable ITF replacement that was more robust than an ITF. 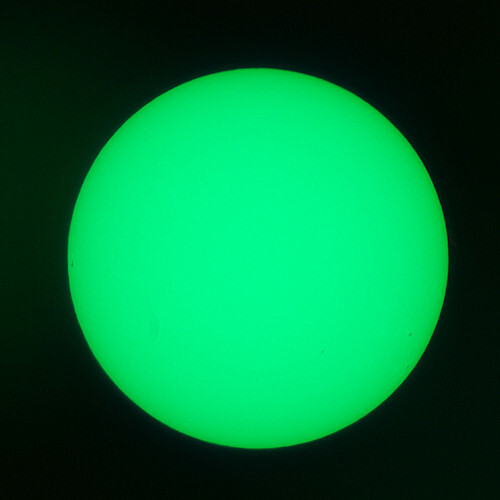 I know that Solarscope uses KG3 filters instead of an ITF. 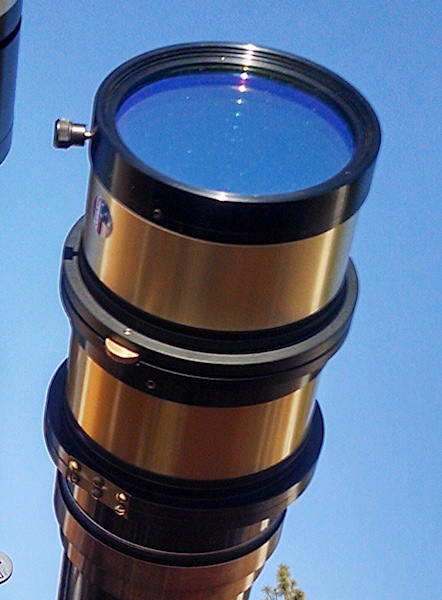 I found that Oliver Smie of Beloptik in Germany http://beloptik.de/en/top/welcome/ sells a very similar KG3 filter with additional UV/IR blocking http://beloptik.de/e...locking-filter/ which appears to have IR blocking equal or superior to an ITF. It is available in 1.25 and 2 inch versions. 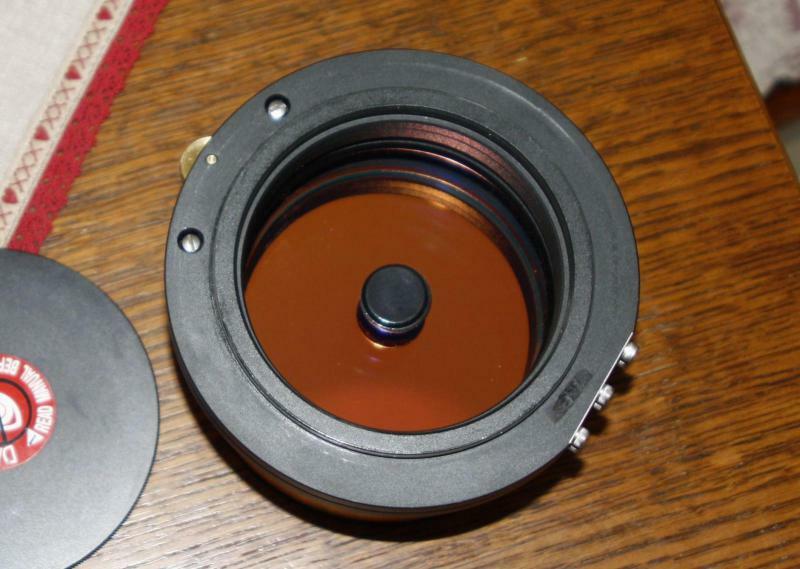 Even better, for a modest fee Oliver turned down the 2 " KG3 UV/IR filter to 34 mm so it would be a direct drop-in replacement for the rusted ITF - an advantage so that the tilted filter cell could be used. Edited by BYoesle, 15 March 2015 - 02:31 AM. 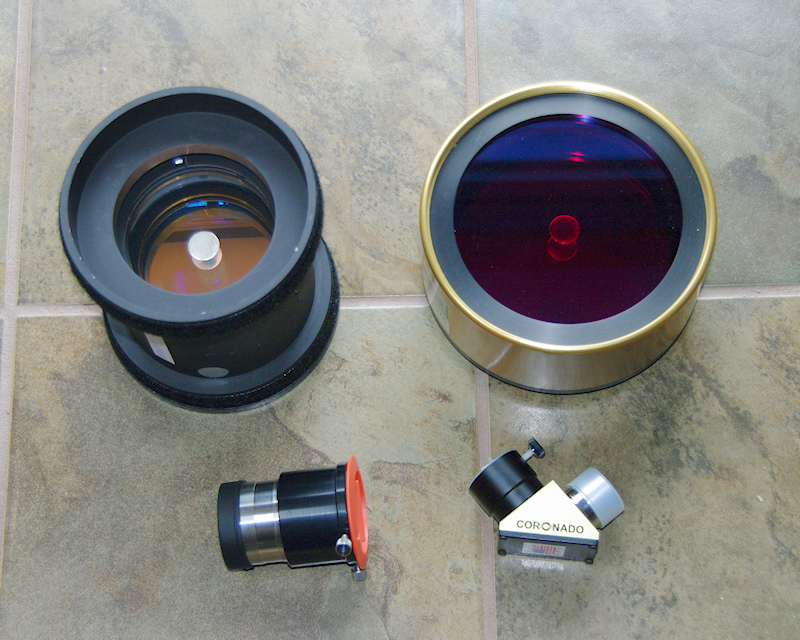 The versatility of the new system mimics what Solarscope provides with a 2 blocking filter solution. For single stack use I use the DERF with the primary etalon sans RG630 ERF, as the original BF30 has this component. The image brightness is "just right" as Goldilocks would say. For double stacked use, I add the secondary SM90 with the re-installed RG630 ERF - while still using the DERF as the first element to prevent any etalon heating - and the KG3/BF30 sans RG630 provides a bright crisp image, and has cut my imaging exposures in half! Edited by BYoesle, 15 March 2015 - 09:43 AM. Interesting and informative thread ! 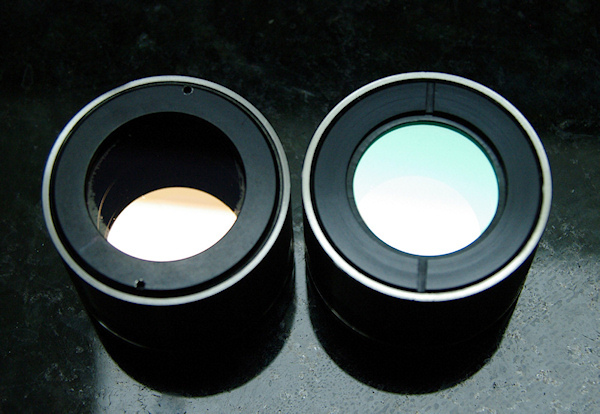 ("rust") on our solar scope filters : Ethalon, ITF, Block filter...) ? 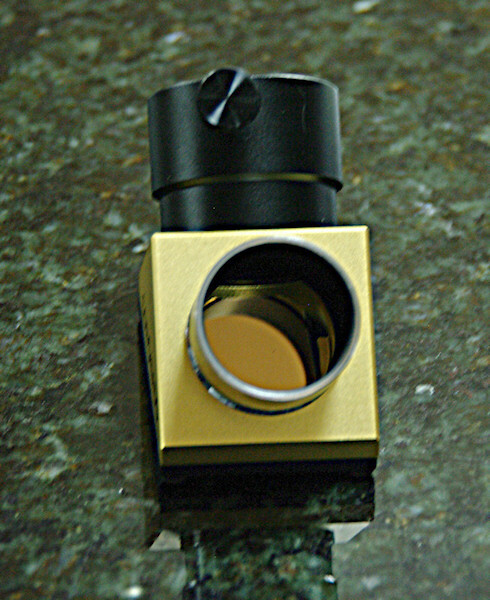 and advises storage of the solar scope in a protecting case with low humidity. With "proper handling and care" (as Lunt writes), the ethalon should "last a lifetime". and what are your experiences of "life expectancy" for your solar scope components ? Edited by AllanDystrup, 16 March 2015 - 09:33 AM. 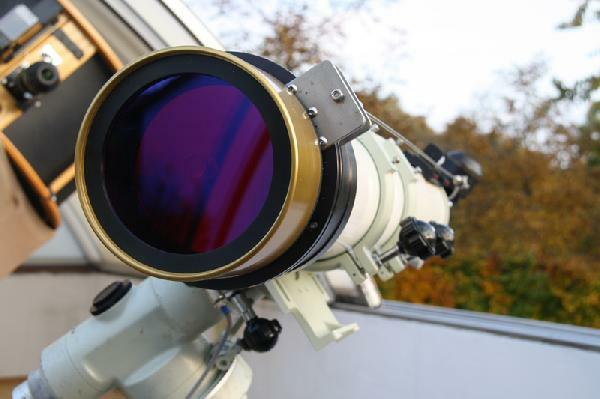 The important thing to remember is that there are many filter components in an narrow band solar filter system, with complex coatings which may be located in various places within the filter system or telescope. The general principles are as you have noted - keeping harmful UV/IR away from sensitive components with pre-filters, and reducing exposure to humidity as much as possible. A milligram of prevention is worth a kilogram of cure. Using the highest quality IR/UV blocking pre-filter in front of my telescope objective, and being fastidious about moisture prevention (as shown in the link above) has resulted in no sign of failure of any component in over 5 years. My understanding is that Lunt no longer uses an ITF for mid to long wave IR blocking, and they may use a KG or BG filter w AR coatings instead. Edited by BYoesle, 16 March 2015 - 11:26 AM. My CaK PST's ITF also failed, and can't be replaced. So did mine, AR coated KG3 from Thorlabs is what I use now along with a Baader K-line. Yikes! I hope you won't be using the proposed filter combination visually Bob. No -- absolutely not! I only do CaK imaging, no visual as I can't see that wavelength worth a darn to begin with. Moreover, the UV part of the spectrum is nothing to fool around with visually anyway, and that is what 394 nm is to begin with - so only imaging for me. I've just finagled my way into obtaining one of my dreams, the "Holy Grail" Coronado SM140 with an internal SM90 double-stacking module. 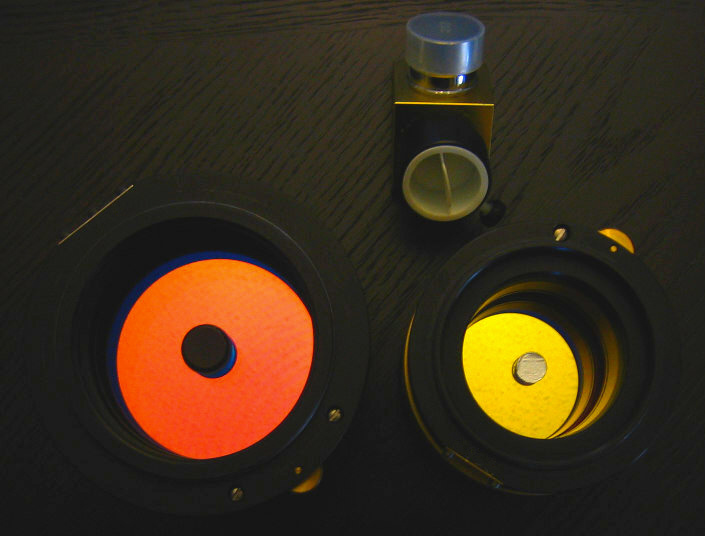 Only six (6) SM140's - the largest commercial H alpha filters - were made by Coronado Tucson -- three by Andy Lunt and three by Brian Stephens (both now with Lunt Solar of course), and only two were equipped with double stacking modules. 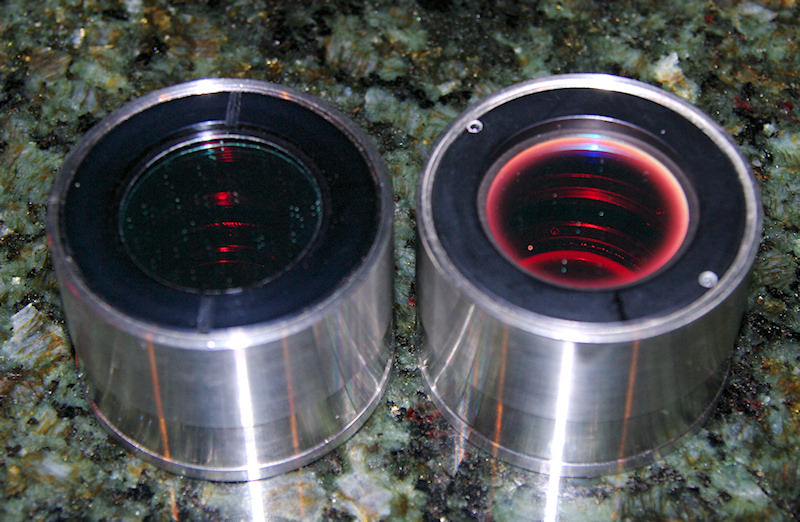 One (allegedly with an internal SM60 module) is used at the Vatican Observatory in Rome, and the other was presented at HOTS (Hands On The Sun) in Tucson late in 2005 using the SM90 internal module installed in a TAK FS 152, where I was able to view through it first-hand, and the image was pretty darn awesome. I will be putting this system together hopefully soon with a more than adequate 150 f8 achromat. I have a catalog circa 1964 that has that filter in it. Attached below is one page. Pretty advanced for it time. 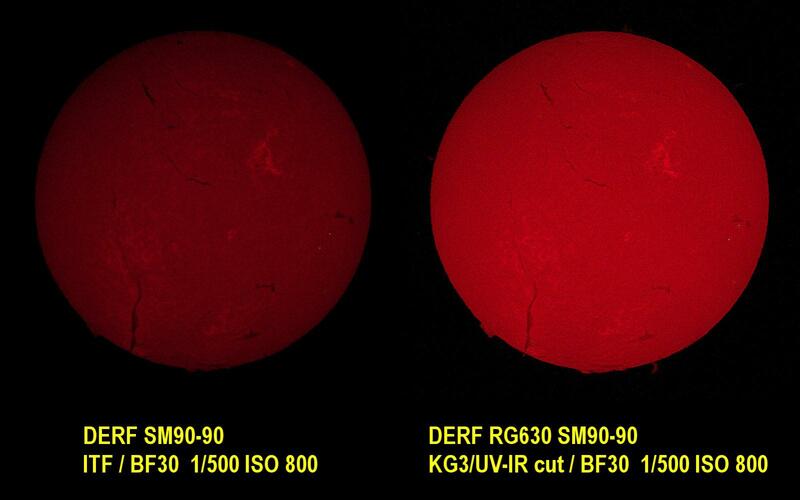 Are these the solar eyepieces that we are advised to destroy because they are so dangerous? I've never seen one. Like Larry Alvarez I have a rose colored Solarmax 90 etalon type 1, but I think it's a Meade production, not pre-Meade (Coronado - Meade is mentioned in the doc). Bob or anyone, do you know why Meade produced both yellow and rose etalons and what the rose is made of ? Edited by jacquesfrr, 26 April 2015 - 12:24 PM. Man o'man that's the rarest of the rare! I think it found its way to the right person though. Thats one sweet setup. 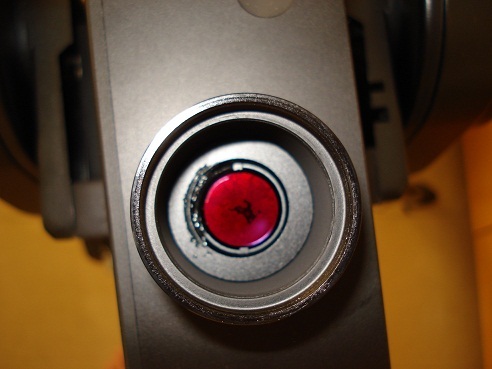 This is a picture of the rusted Coronado PST ITF before replacement, showing a marble-like effect in the coatings. I went through 2 of the original Coronado PST ITF's, when I opted to purchase a Meier Photonics ITF, which appears to resist rust much better than the two original ITF's. Edited by flintzis, 07 January 2019 - 04:11 AM. My Coronado PST ITF is rusty, I am looking for "Meier Photonics ITF", can it be used for visual observation, is there a risk of solar ultraviolet or infrared? I am now looking for an alternative that can be observed with the naked eye.